We recently took part in a 1920s photo shoot which featured on both the Bridal Musings blog and Style and the Bride. A selection of our china, candelabras, picture frames and cutlery were used to emulate this very decedent era. We love the glamour of the 1920s, but then you might have already guessed that! What is great is that films like the recently released ‘Great Gatsby’ by Baz Luherman have brought 20s elegance, opulence and style back into the world of fashion, weddings and events. Leonardo DiCaprio and Carey Mulligan play the lead roles in the dazzling film, which is jam-packed with glamorous outfits, lavish parties, sharply dressed men, women adorned with diamonds and pearls. If you haven’t seen it, grab your popcorn and your best friend and go as soon as possible! 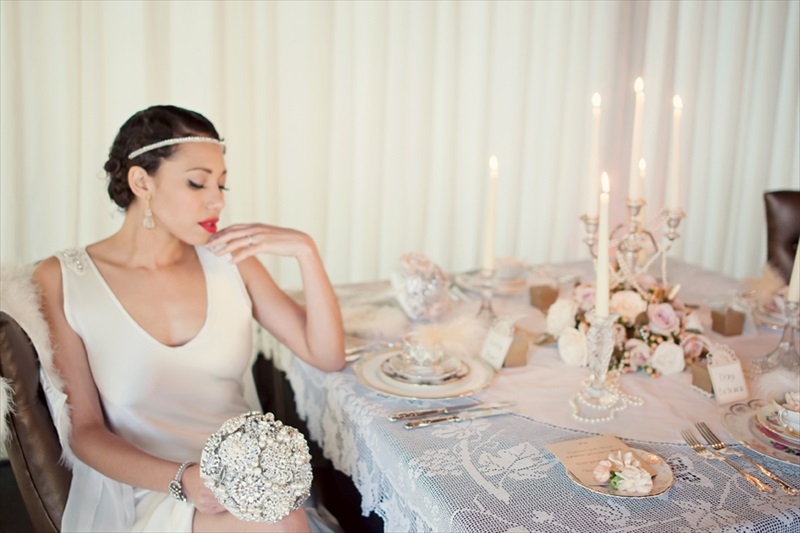 The photo shoot creates so many ideas for brides looking to create that 20s inspired look. We were delighted to see our vintage candelabras draped in pearls while a beautiful centrepiece of roses, Hypercom and gilded foliage made by Elizabeth from Bridal Musings laid out beneath. 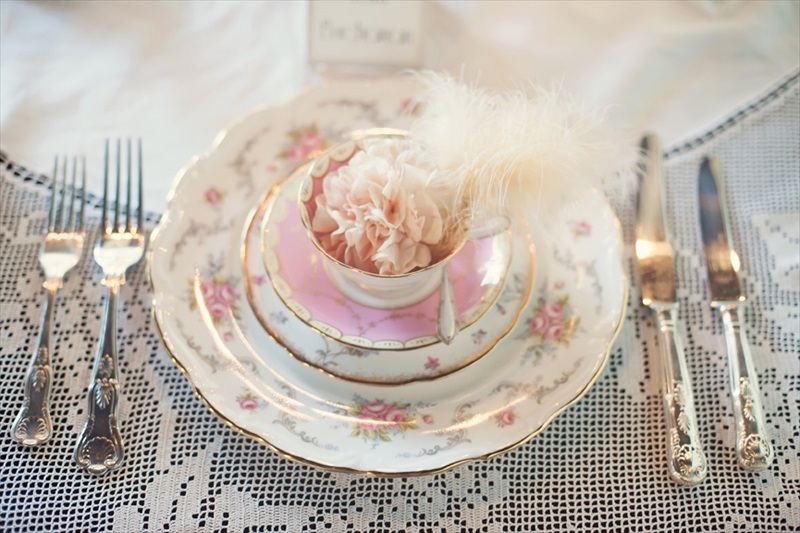 The backdrop of neutral, yet glamorous colour palette really showed off our pink teacup and saucer with its beautiful ribbon edging in white and gold, with matching side and dinner plate. 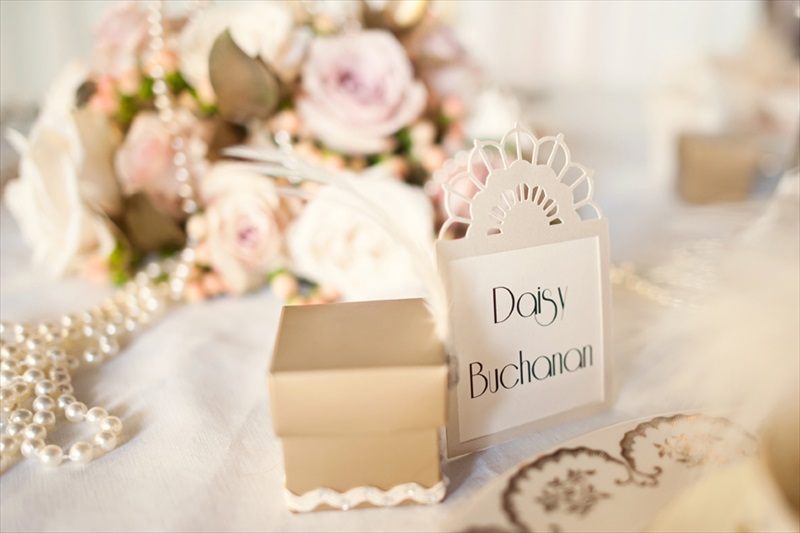 We can’t help but think its waiting for Daisy Buchanan! 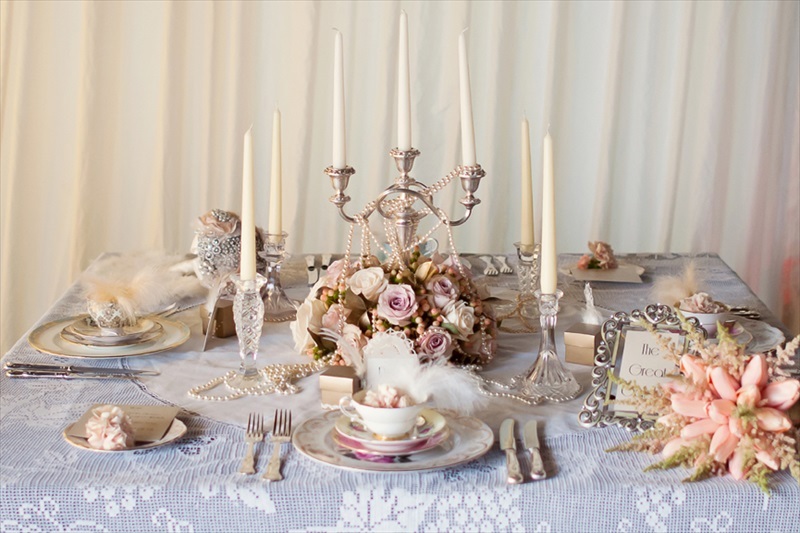 Our vintage glass candle sticks, picture frames and cutlery were all used to furnish the table for the shoot shown off by fabulous accessories and favours by Lau of French Made and stationery by The Finer Details. As seen on Style and the Bride Blog, click on the badge to view the blog in full. As seen on Bridal Musings Blog, click on the logo to view the blog in full.